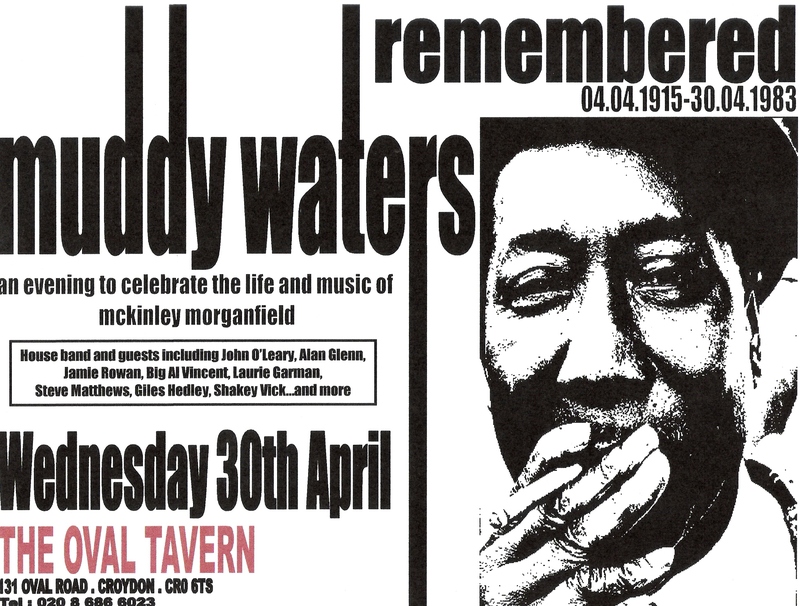 This was a remarkable evening with a galaxy of British Blues musicians who had come together on the 25th Anniversary of the passing of Muddy Waters to celebrate the man and his music. Muddy is one of the pantheons of "blues greats" that include Robert Johnson, Son House and Howling Wolf. For the purposes of cohesion John O'Leary had created a house band to provide the underpinning to what turned out to be a great night with some wonderful combinations of musicians. The house band consisted of John O'Leary on harmonica and vocals, Alan Glen on guitar,harmonica and vocal, Big Al Vincent on guitar, Glyn Evans on bass, Jamie Rowan on keyboards and Joachim Greve on drums . Among the invited guests were Giles Hedley on guitar, harmonica and vocal, Shakey Vick on harmonica and vocal, Laurie Garman, harmonica, Otis Grand on guitar, Dave Dix on harmonica and Dave Raphael on harmonica. The evening started appropriately in the Delta with Giles Hedley playing acoustic guitar and rack harmonica on "Louisiana Blues" and the "I Be's Troubled", both from the Alan Lomax recordings at Stovall's Plantation. Then Giles invited Laurie Garman up to play harmonica on "Your Gonna Miss Me"(When I'm Dead and Gone)", all played with the gravitas and the authenticity you come to expect from these two fine musicians. The house band got up to back John O'leary playing harmonica and singing on "Young Fashioned Ways" with fine guitar from Alan Glen. Then Shakey Vick fronted the band on vocal and harmonica to perform "Crossroads" and "Standin' Aroung Crying". Alan Glen then sang on "Divin' Duck Blues" with great work from Laurie Garman on harmonica and Big Al Vincent on guitar. Alan Glen sang on "King Bee" with fine harmonica work from Laurie. John O'Leary then fronted the band on "Drifting Blues" and the frenetic first set finished with Dave Dix playing harmonica on "Hoochie Coochie Man".